*information for this post was in part supplied by Hormel Foods through their Hormel Extended Family Blogger program. No compensation was received for this post. One of my favorite smells of summer is the smell of dinner cooking on the grill. When we are outside playing and I smell a neighbor cooking their dinner on the grill, it makes me want to change up my menu plan (if I didn't plan grilling) or get dinner started if I am grilling. I used to not be very adventurous about grilling. I pretty much kept to simple things like hamburgers and hot dogs and chicken breasts. After a while, I started grilling vegetables when I discovered how delicious they can be. I love to cut up peppers, onions and squash and grill them with a touch of soy sauce. I expanded the proteins we grill to include fish - usually Marlin or Tuna. I also started using 'recipes' for grilling instead of just making "plain" seasoned chicken or hamburgers. One of the first recipes we tried was Citrus Balsamic Grill. The citrus inspired me to explore some fruit on the grill. I discovered how delicious grilled pineapple rings are. I always have loved warm pineapple in recipes, but this took it to another level and makes a delicious side to a chicken breast seasoned with a bit of Teriyaki sauce and grilled. We also really enjoy our shrimp and pineapple kabobs. They have a great flavor and are relatively low in calories too. If we decide to really mix it up this summer, maybe we will explore some of the ideas shared with me by Hormel. Bacon - this was the first on their list. According to Hormel, grilling bacon gives you the perfect mix of crispy and chewy, making it a tasty accompaniment to any meal. You can find a lot of recipes for Hormel Black Label bacon on their website. If you are planning to grill it, you will want to buy the thicker cuts, because they will be easier to handle and less likely to fall through the grates. You will want to heat your full grill and then turn off the one side (or set the coals to the one side if using charcoal), so that you can cook on the side opposite the heat - otherwise the dripping grease from the bacon could cause the fire to flare up. Pizza - I have tried one pizza on the grill before. I think the most important thing is choosing a dough that will not fall through the grates. Top your pizza with sauce, cheese, Hormel Pepperoni and your other favorite pizza toppings. I am thinking that grilling my onions before putting them on the pizza would be a great flavor addition (or maybe some of that grilled bacon?). SPAMBURGER - Check out their website for a grilled SPAM and pineapple burger. What are some of the different things that you make on your grill? No compensation was received for this post. All opinions expressed are mine or those of my family. I am completing this post as a participant in the Hormel Foods Extended Family Blogger program. Hormel Foods provided some product and some of the information for this post. I have been doing a lot of reading lately. It has been simply glorious. Fortunately, I have had a steady stream of choices to get me geared up for summer reading. 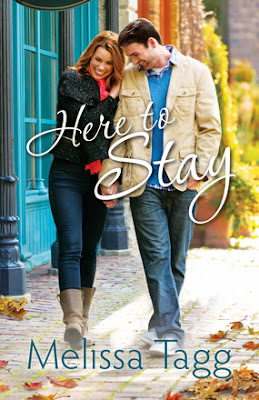 I recently finished reading Here to Stay by Melissa Tagg. This is her second novel and follows Blake "Blaze" Hunziker, who we met in Made to Last, back to his hometown. In Here to Stay, similar to her first book, Melissa Tagg tells the story from two vantage points. That of Blake Hunziker and Autumn Kingsley. Blake, who we met in the last book, has been traveling and working around the world for the past few years, trying to escape the shadow of his brother's death. He returns home hoping to finally settle down, but unsure how his family and the town will accept him. Autumn is trying desperately to keep her family's inn in good repair and wanting to take off on her own adventure. The two find themselves working together, each seeing the opportunity as a means to an end, but as you might expect, their feelings for each other begin to evolve. The story explores their evolving relationship and even includes visit from Miranda Woodruff from Made to Last. I really enjoyed getting to learn more about Blake's story and his 'mysterious' history that he had made references to in the earlier book. The characters in this book are nicely developed by Tagg and as such, are easy to relate to and I found myself cheering to help them along. The characters come to find strength in their faith and it helps shape their story. This was a nice, sweet romantic story that was a great way to kick off my summer reading experience this year. If you are looking for a fun, romantic story, this is a book that you will want to check out. Of course, I am ready for the sequel already, so I can find out what happens next. You can learn more about Melissa Tagg and her books at her website. Thankful by Shelley Shepard Gray | Win the first two books in the Return to Sugarcreek series! In Thankful, New York Times bestselling author, Shelley Shepard Gray captures the beauty, devotion, and warmth of Amish life in this engaging tale of family, commitment, trust, and love set in the beloved community of Sugarcreek. Enter to win the first two books in Shelley's Return to Sugarcreek series, Hopeful & Thankful. Reading is definitely a favorite past time of mine and fortunately, lately, I have found myself able to make time to read more. Whether on a rainy day when our sports calendar has been cancelled leaving us with no real plans or on a pretty day when I can sit on the deck and read while the kids play, it has been nice to have the additional time to read. One of the books that I have recently read is Thankful by Shelley Shepard Gray. This is the second story in her Return to Sugarcreek series. She writes such a nice straight-forward, easy to read story. The style works well for putting down and picking back up several times over a couple of days without having to flip back to remind yourself where you were - which was perfect for the way I read. Again, the characters in Thankful are warm and the type that you can't help but feel a connection to and find yourself rooting for things to turn out the 'right' way. The story moves easily between characters and their stories and progresses nicely. One nice thing is that the characters from the first book, Hopeful, returned in this story - some simply in the background, and others finding their story continue to progress. I always love to continue to watch stories evolve for those that you came to know in another book - it makes me feel somehow complete. As with Hopeful, Thankful is set in Sugarcreek, Ohio - which, as I mentioned before, I think is fun, because it is an actual community and one that I have visited. I have been there a few times - not enough to recognize any landmarks from the storyline, but I still felt connected knowing I had been there. The main story could have been set almost anywhere and with any community of people, with it's universal theme. How close is too close for love? As children, Aden and Christina always had a special bond and saw the other as a likely future spouse, but when he came to live with her family and were raised almost as siblings, can they ever be more than friends? And, what might be the cost to each if they do? One of the other main stories that was developing was the continuing story of Judith and Ben, who as we learned in Hopeful, can not have children of their own. As they proceed down the path of adoption, they decided to participate in the foster system. They find themselves having to come to an inner peace with being foster parents to a baby that is not from their community and from a mother that is in the prison system. I liked that the book was more about the story's characters and what was going on in their lives, rather than being about them being Amish. There were some non-Amish in the story because of where they live and work and because of their need for transportation, but it wasn't full of Englisher influence or support. I enjoyed reading this second book by Gray and look forward to reading the future books in the series. Christina Kempf has always known that God chose Aden Reese to be her husband. As children, he was there to save her when she fell through the ice, and he's been by her side ever since. After his parents died in a car accident ten years ago, the Kempfs raised Aden as one of their own, and everyone sees Aden and Christina as brother and sister. But Christina has never given up hope that Aden will one day ask her to be his wife. Aden always planned to court Christina. But losing his mother and father changed everything---except his love for her. Her parents generously welcomed him into their home and treated him like a son. He can't betray their kindness by admitting his feelings for the girl who is like a sister . . . yet so much more. Pressured by her parents to court, Christina begins to accept the attentions of Sugarcreek's young men, and now, Aden must make a choice. Will he stand by and watch the love of his life slip away? Or will he risk losing the love and trust of the family he holds dear to tell Christina how he truly feels? About the author: Shelley Shepard Gray is a two-time New York Times bestseller, a two-time USA Today bestseller, a finalist for the American Christian Fiction Writers prestigious Carol Award, and a two-time Holt Medallion winner. She lives in Southern Ohio, where she writes full-time, bakes too much, and can often be found walking her dachshunds on her town's bike trail. You can find her on Facebook and she has a website. Thank you to all the men and women who have bravely served our country. What a good weekend. Friday evening, we went to the movies as a family. We went two separate ways at the theater with my son and husband checking out Million Dollar Arm and my daughter and I watching Legends of Oz. Saturday was rainy and we wound up only playing soccer in the morning and the other sports wound up cancelled. It was sort of nice just to be around the house with unexpected time. I finished a book, did laundry and relaxed. Then we watched a movie at home as a family in the evening. Sunday we had one game and one practice for the kids. The balance of the time was spent outside. The kids playing with friends, my husband mowing and I was able to put in my garden and flowers (so glad it wasn't June like last year). It is officially another crazy week around here. Kid's sports are in full swing. I don't think that we have a night this week where we only have one activity. Most nights it is that each kid has an activity, but there are a few nights where we will have to make a choice between activities for the kids. Fortunately, the school year is winding down and things will relax a little in a few weeks. I get to start summer hours in a few weeks and get to enjoy extended weekends as a result, of course, it will make the rest of my schedule a little tighter as I put those hours in earlier in the week. The menu plan this week has a theme of quick to table. Now, some of them require some prep time, it is either that my husband can put it in the oven and forget about it until dinner time or that I can cut and prep in advance, so we simply have to serve. For breakfast, most days the family enjoys cereal or toast, with the occasional oatmeal or breakfast sandwich entering the mix. Lunch is either the school hot lunch or a packed sandwich for the kids and leftovers or microwave meals for my husband and I. This menu plan shared at Menu Plan Monday. It is May. The thermometer may not be a good indicator of the month, but the schedule sure is. We are full swing into baseball, softball and soccer - some are lagging a little, but the schedule is full. So, we are back on the cook once eat twice (or more) approach and the quick prep meal approach for menu planning. Fortunately, we are usually still able to make eating as a family (or at least 3 of us) work for us most nights. I like that, it is a chance to reconnect and catch up on our days. Breakfasts and lunches are pretty straight forward at our house. During the week, cereal is the poplular favorite, but sometimes we have bagels or English Muffins or a sandwich from the freezer. Weekends, we will sometimes make cinnamon rolls or traditional hot breakfast foods. Lunch on the weekends is usually leftovers or sandwiches. During busy sports days, we pack a lunch to take to the fields with us to keep us nourished throughout the day. During the week kids have hot lunches from the school or the occasional packed lunch. My husband and I continue to rely on leftovers, frozen meals and sandwiches for lunch. *complimentary review copy received for this post. Desperate is the latest technical thriller from Daniel Palmer and I was lucky enough to get an advanced copy to read. In fact, I was finishing the last chapters earlier this week when the book was released. The book did not disappoint. The story is told from the viewpoint of Gage Dekker and centers on the story of him and his wife Anna Miller. Gage lost his first wife and his son in a tragic car accident. He is still very much so dealing with that loss, years later when this story takes place. His second wife Anna met him at a grief group that he was attending and which she had joined to help her cope with the loss of her son. After a quick relationship, they were married and had decided that adoption was the way for them to start a new family together, after a miscarriage. They decided to go the route of a direct adoption and had built an online profile on a site that allows parents seeking to find a family for their child a way to review families that are looking to adopt. As the story opens, Gage and Anna come upon a young woman, Lily, crying at the bus stop. Newly pregnant and homeless, they invite her to move into their apartment to give her a safe place to live while she carries a child, that they plan to adopt. When she gives them gifts for welcoming them into their home, Gage begins to question her motives. It seems that as time passes, more unsettling things begin to happen and as Gage begins to question whether there is something going on, a wedge is driven between him and Anna. Desperate was a real page turner, that I simply didn't want to put down. Fortunately for me, I was on a four and a half hour flight, so I had time to read most of the book uninterrupted (other than by the beverage cart stops). Of course, when I arrived at my destination, I wanted to just focus on finishing the book but my schedule forced me to wait until later to finish. Daniel Palmer does a nice job developing the characters. Gage and Anna are a couple that you can't help but care for and cheer on in their desire to become parents again. Of course, since the story is told from Gage's perspective, he is the one that you get to know best, but Daniel Palmer does a great job developing the other characters too - Anna, Brad, Lily and Roy. Sometimes, when reading thrillers, I wonder to myself, which is more scary - the events happening in the story or the fact that someone came up with this idea for a story. This story was no different. With all of the twists and turns, it makes you wonder how could the characters have discerned happenstance from plot. There were some really good twists and turns in the story and as each became apparent, I found myself asking "really?". 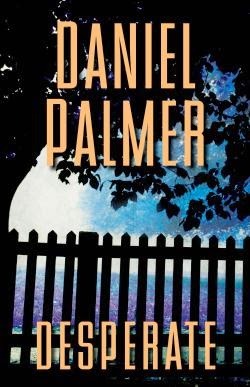 The book started slower than some of the other books I have read by Daniel Palmer, but once it got moving, it was non-stop. I would recommend Desperate to any lover of thrillers. After a heartbreaking miscarriage, they begin the long adoption process, until fate brings Lily into their lives. Young, pregnant, and homeless, Lily agrees to give her baby to Gage and Anna in exchange for financial support. It’s the perfect arrangement for everyone. Seeing his wife’s happiness and optimism for their new life and child, Gage begins to feel a sense of hope he thought he’d lost forever. No compensation was received for this post. A complimentary advanced reader's copy was provided for this review. All opinions expressed are my own or that of my family.